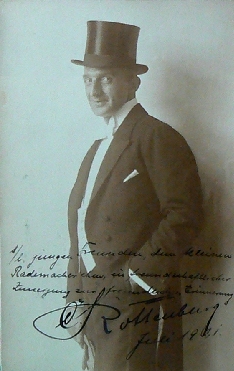 The actor Kurt Rottenburg joined the film business in 1920 when he was engaged as a director assistant for the movie "Lederstrumpf, 1. Teil: Der Wildtöter und Chingachgook" (20). In the second part of the movie "Lederstrum, 2. Teil: Der Letzte der Mohikaner" (20) he was not only a director assistant but also impersonated the role of the Indina Magua. In the next years he took part as an actor in other silent movies like "Schieber" (21) with a then unknown Hans Albers, "Das Geheimnis der Mumie" (21) with Ferdinand von Alten, Aud Egede Nissen and Magnus Stifter, "Der schwere Junge" (21) with Margarete Kupfer and Hermann Picha, "Das Rätsel der Sphinx" (21) witht Ellen Richter, Erich Kaiser-Titz and Albert Patry, "Die Abenteuerin von Monte Carlo" (21) with Ellen Richter, Anton Pointner and Eduard Winterstein as well as "Im Glutrausch der Sinne" (22) with Carl Auen and Sascha Gura.